When we think about the word passion many things come to mind. Most of these would involve things we love to do. In the movie “Passion of the Christ” by Mel Gibson and in the gospel account of the last hours of Jesus life here on earth we see a different meaning of the word passion. The word passion originally came from a Latin root meaning “to suffer”. And as the final hours of Jesus life plays out from the betrayal in the garden to the hours on the cross we see both. Passion driven by love, endured because of it. It is what He was meant to do. In his blog post “Why there Was No Crowd at the Foot of the Cross” Kelly Flanagan writes this “In the span of a week, He’s gone from having an obvious stamp of divine approval to being banged up and beaten, a sign to the crowds of divine rejection”. At the end the crowds who only a few days before were shouting “Hosanna to the King” are gone. Only three remain…. His mother, Mary Magdalene, and John. My reason for writing this morning is twofold. One to remember and give honor to the extraordinary story of the cross, the suffering, the passion that Jesus endured in our place. Two to encourage you in the passion you may find yourself in this season of your life. If you are in that time where you realize you’ve truly found your purpose in life, and your passions are being tested, you have a choice. It doesn’t matter if the crowds are following or if there is only three, maybe one, You can go back, or you can call back “I’m all in. This is what I am here to do, and I’ll do it until I can’t do it anymore”. Jesus set an example for all of us to follow. It’s what you were meant to do! “Now at last they were beginning chapter One of the great story no one on earth has read: which goes on forever”. I love this line at the end of the Last Battle by C.S. Lewis. Everyone has a story to tell and ultimately we are all part of a greater story that someday will be revealed in full. “ For now, we can only see a dim and blurry picture of things”. ( 1 Corinthians 13:12). My story is not remarkable, although the events I have had the privilege in my life to witness have been. I grew up in the south “the land of cotton” and the old times there were definitely not forgotten. I remember where I was and what I was doing when JFK and Martin Luther King were murdered in Dallas and in Memphis. I remember the Civil Rights movement, a time of great unrest and change. I remember the dawning of the “Age of Aquarius” in the late 1960’s. It was also the dawning of my love for playing music, a love that has stayed with me throughout my life. If my life were chapters in a book one would tell of my precious bride of 20+ years who endured so much and stood beside me through the good and the bad. One would describe the blessings of being a father and a grandfather. One would tell about how despite being “the wretch” the song sings about God was able to change me, and use me to make a difference in others lives, make me a servant in His church, and surround me with friends all because of His goodness. All part of a story that has had many twists and turns. I think of the words Jimmy Buffet wrote in one of my favorite songs "As a dreamer of dreams and a travelin’ man I have chalked up many a mile Read dozens of books about heroes and crooks And I learned much from both of their styles" And so it is true for me. But in all of my travels and all I have read and experienced nothing compares to where I am headed. The place where my story here ends and the story that goes on forever begins! "" I am confident that He who began a good work in you will carry it on until completion until the day He returns". Philippians 1:6 My hope is that as we all run our race that in some small way my words will encourage and speak to you, as your story is being written. And draw you ever closer to the One who loves you. Further up and further in! 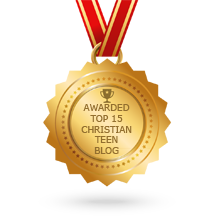 This entry was posted in A CLICK A BLESSING TODAY, Christian Teens Blog JF, CHRISTIAN TEENS BLOGS, Christian Teens Blogs - He is my Peace, Christian Teens Blogs - He is my Peace, Light and Refuge, SHARING STRUGGLES, TAPESTRY TREASURES and tagged Cross, jesus, passion. Bookmark the permalink.